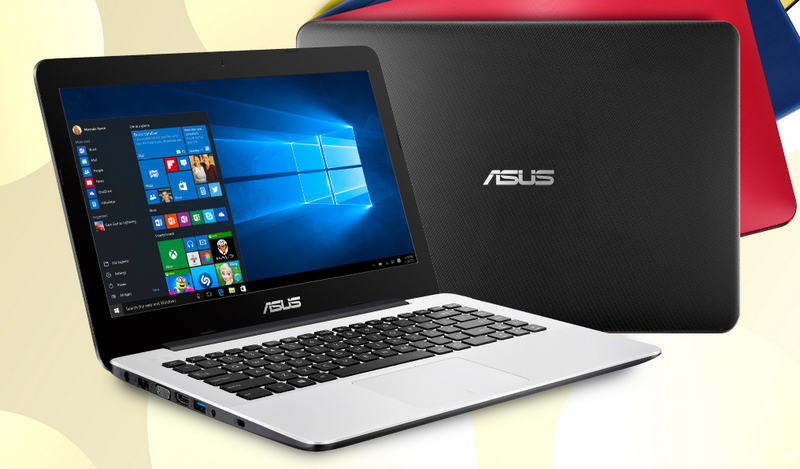 Renowned Taiwanese electronics company Asus has a Christmas treat for students, young professionals, and even small business owners who are currently looking for a reliable and budget-friendly daily laptop. 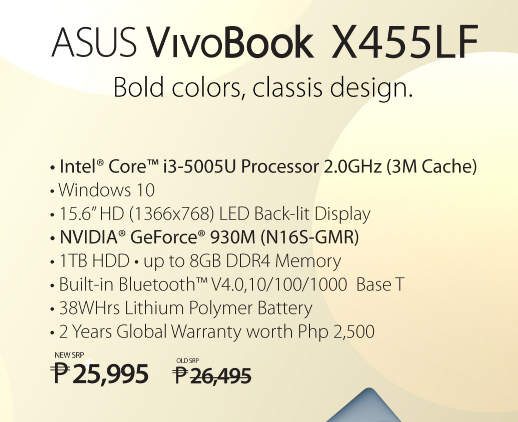 The brand has slashed hundreds of pesos off the SRP of some of its popular VivoBook Series models, putting them more at arm's reach of more Pinoy consumers. 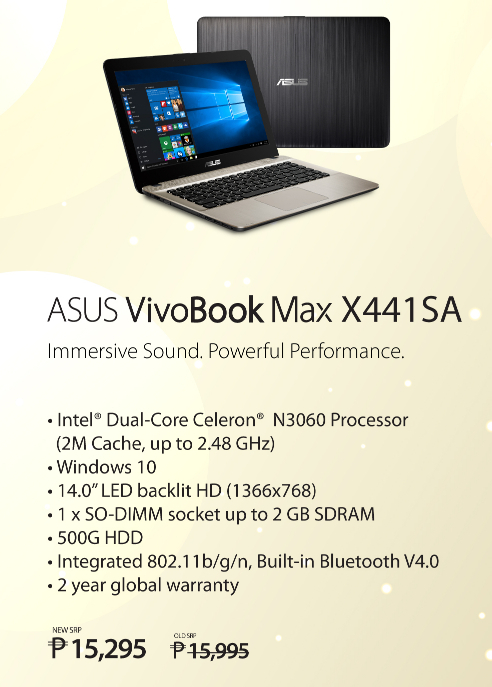 In this bunch, the notebook I like most is the Intel Core i3 powered Asus VivoBook X455LF. Why? Well, for Php 25,995, this 15.6-inch notebook already has a dedicated NVIDIA GeForce 930M 2GB graphics card that can help boost its performance plus it has a generous amount of HDD at 1TB! This is certainly powerful enough to run all Microsoft Office programs for school or work as well as 3D games that are not so specs-intensive. 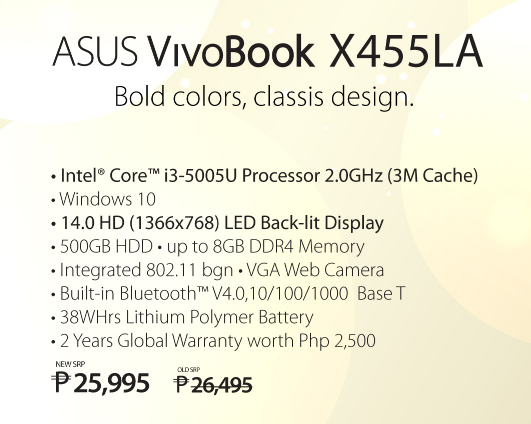 Asus VivoBook X455LA has the same discounted price as X455LF but has less impressive technical specifications. Nonetheless, having a same resolution (1366 x 768 pixels) 14-inch LED back-lit display, it is lighter and more portable than its sibling. 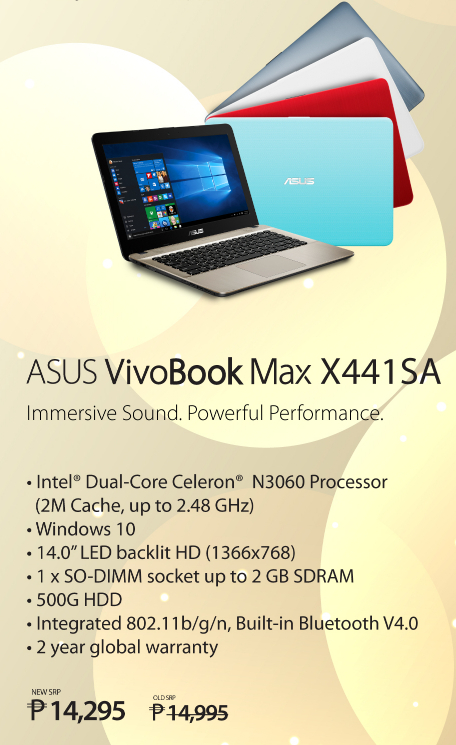 The very wallet-friendly VivoBook Max X441SA variants are crafted to deliver a decent everyday web-browsing and word-processing experience. If you just need a notebook to stay connected to the internet, to type Word documents, to work on Excel sheets, or to create PowerPoint presentations, these should be good enough for you. 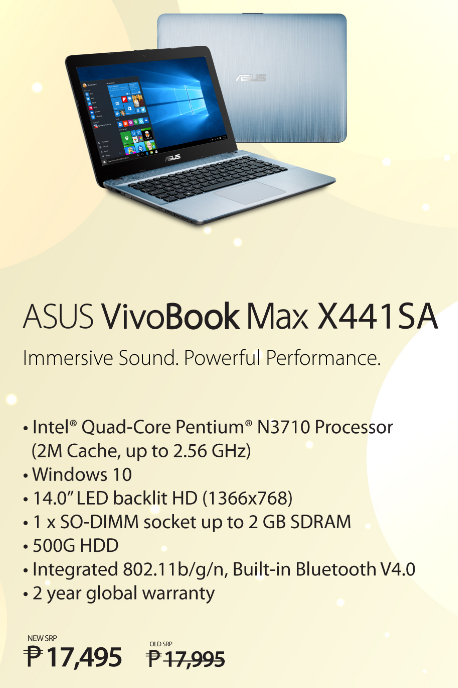 As you can see, all Asus VivoBook Max X441SA variants sport a 14-inch 1366 x 768 pixels LED backlit display, has 2GB of RAM, and come with 500GB of HDD. They vary in terms of their cover design and the processor powering them. The more expensive versions have a brushed metal look on the outside and are powered by a Quad Core Intel Pentium N3710 chipset. For more information about this sale as well as all models included in the promo, feel free to visit an Asus Concept Store in a mall near you and talk to the sale staff anytime within this Holiday Season.